News from Microsoft official website, Microsoft Azure Administrator AZ-100 and AZ-101 exams will be retired on May 1, 2019. The new replacement test is AZ-103 Microsoft Azure Administrator. 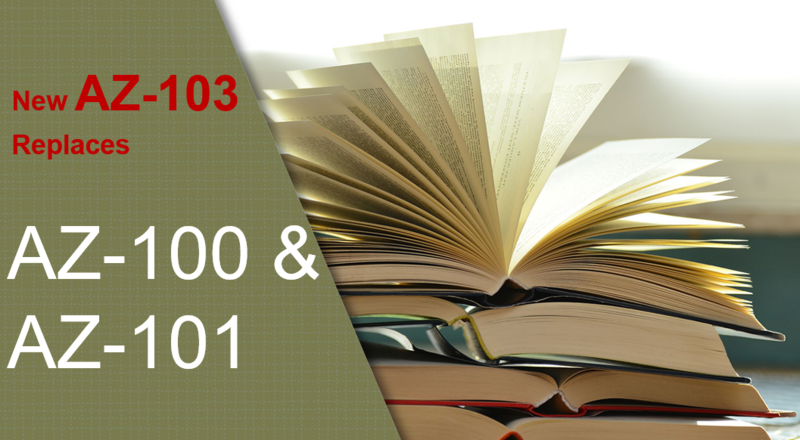 Between now and May 1, 2019, you can also register AZ-100 and AZ-101 exams. From May 1, 2019, you can only register Microsoft Azure Administrator AZ-103 exam to earn the certification. The following screenshots are from Microsoft official website. If you want to take Microsoft AZ-100 and AZ-101 exams to earn Microsoft Certified: Azure Administrator Associate certification, please take them before May 1, 2019. If you have passed 70-533 exam last year, you can choose to take AZ-102 exam to earn this certification. Note: if you DO NOT pass 70-533 exam and take AZ-102 exam, you CANNOT get this certification. Microsoft Azure Infrastructure and Deployment AZ-100 exam validates that you have ability to accomplish the following technical tasks: manage Azure subscriptions and resources, implement and manage storage, deploy and manage virtual machines (VMs), configure and manage virtual networks, and manage identities. Microsoft Azure Integration and Security AZ-101 exam validated that you have ability to accomplish the following technical tasks: secure identities, evaluate and perform server migration to Azure, implement and manage application services, and implement advanced virtual networking. Microsoft Azure Administrator AZ-103 exam validates you have ability to accomplish the following technical tasks: manage Azure subscriptions and resources; implement and manage storage; deploy and manage virtual machines (VMs); configure and manage virtual networks; and manage identities. From the above information, you can know that AZ-103 tasks are the same as AZ-100 tasks. So if you have taken and passed Microsoft Azure AZ-100 exam, you will automatically be awarded the Microsoft Certified: Azure Administrator Associate certification. We provide the latest Microsoft Azure AZ-100 and AZ-101 real exam questions, which can help you pass the two exams in a short time. Besides, we will crack the latest Microsoft Azure Administrator AZ-103 real exam questions soon, please pay more attention the news on our website.